Music is delivered through all the car's speakers*, giving the driver and passengers exceptional sound quality and the breathtaking effects (Virtual SuperBassâ¦). To ensure optimal audio quality when on the phone, the Parrot MKi9000 combines double microphone technology with new signal processing software (DSP-3) that eliminates background and surrounding noise, including noise from inside the car. For maximum listening quality, conversations are reproduced over the vehicle's speakers. 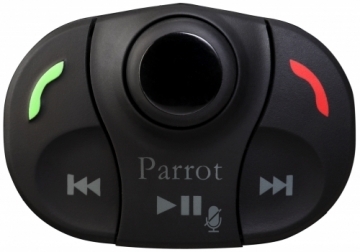 The Parrot MKi9000 is a Bluetooth hands-free system compatible with all vehicle makes* and which works with all mobile phone brands. Kit Contents: Mki wireless remote, mount, steering wheel strap and remote battery, Mki microphone, wiring loom, Mki bluebox, Mki music cable, quick start guide. Parrot MKi9000 A full system dedicated to conversation and music. Made for iPod Works with iPhone. Vehicle - Parrot MKi9000 parrot handsfree, handsfree parrot, parrot fitting, hands free kit, hands free car kits, bluetooth hands free kit, car bluetooth handsfree, in car bluetooth handsfree, bluetooth car handsfree, in car handsfree kit, handsfree bluetooth, parrot installation, iPod, music.